Sadasat Simran Singh Khalsa is a member of Chardikala Jatha, and he is a Hazoori Raagi at Sri Harimandir Sahib in Amritsar. His Kirtan Jetha has played Kirtan and spoken in many Gurdwaras around the world. They have also been the main feature of Camp Miri Piri which originated in Singapore. This video was filmed to help bring attention to the 2015 Camp Miri Piri in Espanola, New Mexico. June 13-17. You can be with him and many other great teachers there. I enjoyed my visit in Riyadh. After few months I gave my blessings to Arabians while standing at the Departures gate of the Riyadh Airport for my flight to India. I knew that I would be cherishing the memories of Riyadh hereafter. 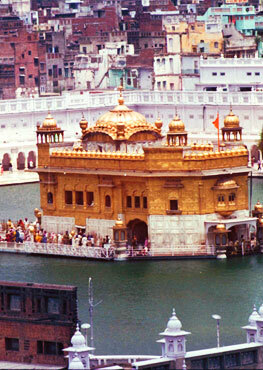 Golden Temple Sending 100,000 Meals to Nepal. The food will be sent through an aeroplane of the Indian army. For now, as many as 20 thousands food packets have already been sent via the first flight. The sacred spaces that constitute the halls and corridors of the Sikh house of worship contains a permeable sense of the spiritual. There is fear and desperation in their empty eyes. They have no livelihood and no work; and their growing children receive no education. Their daughters do not have much hope of finding suitable matches; and they are not certain where the next meal would come from. [VIDEO] A new documentary Sikh Formaggio looks at how the community almost saved the industry from complete collapse after locals began to move away to better jobs. In a landmark decision that is sure to delight environmentalists and pilgrims alike, SGPC has decided to grow natural organic vegetables and grains at its Sattlani Sahib farms near Amritsar. SikhNet got a chance to speak with the co-creator of the new Super Sikh Comic. This is a must read for anyone who is a comic fan or is interested in Sikh media. But despite Mr. Ghani’s pledge to make Afghanistan more inclusive, Mr. Singh says he worries that his tiny religious minority could disappear as more Sikhs and Hindus leave their homeland because of persistent discrimination.